This page includes Book Review columns from the 1998 issues of Across the Fence Post. 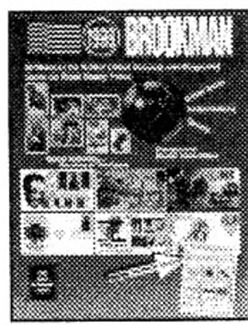 Collectors of United States, United Nations, and Canada will be well served by the popular and newest edition of the Brookman catalog. Collectors and dealers have used the Brookman Stamp Price Guide for more than 60 years. The 1998 edition touts over 4,000 photos, 35,000 prices on stamps and covers, and over 10,000 price changes. As an added bonus, there is $100 worth of redeemable coupons that will help offset the cost of the retail guide. As most stamp enthusiasts of United States material collect stamps in various formats, prices can be found for singles, plate blocks, and mint sheets. Although not every issue is pictured in this guide, there are enough photo examples to aid in identification and there is also a very useful identifier index with listings by subject and/or topic. Revenues, postage dues, and the popular federal duck hunting stamps are listed. There are also listings and photos for state hunting permit stamps. Listings for errors, coils, plate number coil strips, test coils and booklets can also be found in this catalog. United States collectors will find sections on many popular collecting areas in addition to stamps. Cover lovers will find listings for first-day covers, inauguration covers, postal stationery, and even World War II patriotic covers. Listings for souvenir cards and pages and U.S. Postal Service mint sets can also be found. Collectors of United States-related areas will not be disappointed. There are sections and prices for stamps from the Canal Zone, Confederate States, Cuba, Guam, Hawaii, Marshall Islands, Micronesia, Palau, Philip-pines, and Puerto Rico. In addition, this section also lists first-day covers for Marshall Islands, Micronesia, and Palau. United Nations philatelists are served with listings of the stamps of New York, Geneva, and Vienna. U.N. first-day covers, souvenir cards, and mint postal stationery are also listed and priced. Canadian collectors will be pleased, too. In addition to the stamps, one can also find listings of the year sets. Stamps of British Columbia, New Brunswick, Newfoundland, Nova Scotia, and Price Edward Island are also a part of this grouping. The Datz catalogue is well recognized as the premiere reference for U.S. postage stamp errors. The seventh edition, 1998 catalog, is a soft-cover, 6-inch-by-9-inch book with 170 pages listing imperforate, color-omitted, and invert errors. It has an excellent introduction with good definitions of terms used in the catalog. However, the descriptions are empirical with no information about how errors are created during the manufacturing process. I had not questioned the content of the various categories of errors before reading this catalog. The author obviously considers items such as paper foldovers, gutter pairs, and misperforations to be freaks or oddities and does not list them. While many would agree that a number of the curiosities created as a result of manufacturing problems can be classified as freaks or oddities, certain items such as tagging errors qualify to fall in the same category as a color-omitted error and should be listed. For each listing, the author includes a picture of the stamp, date of issue and printer, as well as a current price and estimate of the quantity of the item. The catalog does not differentiate between varieties of stamps arising from different printings such as wet vs. dry printing, Cotrell vs. B-press, shiny vs. dull gum. Where coils are involved, plate number provides price information, and a special section lists known quantities of plate number strips. The quantity information is invaluable. Prices for all errors are considered to be net retail prices and are compiled from dealer price lists, auctions, and the author's judgment. They seem to be in the correct range, with the caution that auction prices for individual items may vary greatly. The major problem I had in using the book is the lack of accepted catalog numbers, making it difficult to find a specific stamp listing. The author uses his own number system with an IM prefix for imperforates, CO prefix for color-omitted stamps, and IV prefix for inverted stamps. And, since stamps are listed chronologically within each section, it's necessary to know a particular stamp's date of issue. Additionally, several numbers have changed since the last edition, so it is difficult to use those found in published articles. Overall, the catalog contains much useful information to anyone interested in errors and is highly recommended in spite of the limitations mentioned. The Krause-Minkus Standard Catalog of U. S. Stamps is a softbound 8 1/2 -by- 11 -inch philatelic resources. Its 528 pages chronicle the more than 10,000 listings for United States stamps issued between 1845 (postmasters' provisionals) to the present. The more than 3,500 photos aid in the identification of stamps. For those unfamiliar with the Minkus numbering system, it should be pointed out that the catalog is divided into sections, each section chronologically arranged. Definitives and commemoratives are listed separately, followed by airmail, special delivery, and other back-of-the-book stamps. Unlike other catalogs, assigning numbers in chronological sequence avoids the confusion of grouping stamps from sets or series randomly throughout the catalog. Definitive stamps issued over several years are listed in the order issued. Special identification sections for some of the definitive series aid collectors in organization. The Minks catalog number appears adjacent to the stamp illustration as well as at the beginning of the stamp listing. (There is no contusing illustration numbers such as is used by Scott.) A new and interesting feature of the Krause-Minkus catalog is the use of Scott catalog numbers, which appear in italics in parenthesis immediately following the Minkus number. 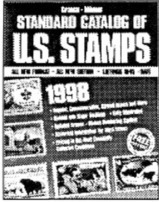 A disclaimer on the title page states: "For the convenience of our readers, this catalog includes the MINKUS'" reference number associated with each stamp and, for cross-reference purposes only, the corresponding SCOTT' number appears in parenthesis." Stamp valuations are listed in unused and used condition in a grade of fine-to-very-fine. This, the publishers say, is more typical of the condition that stamp collectors are likely to encounter and is in contrast to the Scott Specialized Catalogue of U.S. Stamps, which lists the retail value of stamps in very-fine condition. The Minkus catalog listing presents brief, concise, and historical information about the person, place, or thing depicted on the stamp's design, making the catalog an excellent learning tool. Although, not as complete as the Scott Specialized (unless you are really into revenues), the Minkus catalog should fulfill you is United States collecting needs. The prefixes used with the back-of-the-book material is more user-friendly: e.g., "A" for airmail, "SD" with special delivery stamps, "P" for parcel post, etc. Ten pages of easy-to-read introductory material preface the catalog listings. At $19.95, the Krause-Minkus Standard Catalog of U.S. Stamps is a moderately priced reference. It is available from philatelic book dealers or directly from Krause Publications. Book Department PDR8 700 E. Sate St., Iola. WI 54990-0001. When ordering from Krause, remit $19.95 plus $3.25 for shipping (Wisconsin residents add 5.5 percent sales tax)- Charge-card customers can order by calling (800) 258-0929. Although I've never thought of saving triangles as a separate stamp collecting interest, the idea is beguiling, and this book is an intriguing guide to that facet of the hobby. There's no question that Chris Green has done his homework in researching the subject for this book. After reading Chapter 4, I will never again think of a triangular stamp as just another stamp, albeit with a different shape than most stamps. This chapter clearly identifies the widely varying reasons why so many stamp-producing "entities" issued triangular-shaped stamps and then discontinued them. The reason given for the issuance of the very first triangle by the Cape of Good Hope in 1853 was a revelation of ingenious postal treatment to deal with a staff literacy problem. I was going to say stamp-producing "countries," but after considering the second half of the book devoted to revenues and cinderellas, "entities" became the more accurate term for issuers of triangles. They include everything from large national fund-raising issues to municipal and philatelic organizations using triangular stamps in the form of seals and labels for a variety of reasons. Being something of a postally valid philatelic purist, I was taken aback by the amount of space given to these triangular substitutes, or non-postal items. A unique feature of the book is its combination of detailed textual description of the whys and wherefores of almost every kind of triangular stamp, the profuse number of black and white illustrations and diagrams, and the accompanying checklists for the compulsive record-keeping collector. Much of what Chris Green writes about collecting triangles is true of almost every aspect of stamp collecting, but also serves as a kind of come-on for a reader thinking of developing a collection of triangles. Chapter 5 is well titled "Setting Your Sights," with its content enabling a collector to know what to look for. In the process of preparing for this review, I shared the book with a man who's been collecting stamps for over 50 years, a woman who's been collecting for 25 years, and several young people ranging from preteens to early teens. I wanted to check out the cover's claim that it was a guide for beginning to advanced collectors. The suitability of Triangular Philatelics for beginning collectors would be valid if the beginner is a reasonably literate adult. I wouldn't recommend it as a gift to a child or early adolescent unless the person was intellectually advanced. While useful and "indispensable" are not synonymous, the price of $9.95 (U.S.) is right, whether for a collector interested in triangular stamps, a philatelic bibliophile, or a club wishing to add a desirable item to its library. Triangular Philatelics is available from philatelic book dealers or directly from Krause Publications, Book Department PER8, 700 E. State St., lola, WI 54990-0001. When ordering from Krause, remit $9.95 plus $3.25 for shipping (Wisconsin residents add 5.5 percent sales tax). Charge-card customers can order by calling (800) 258-0929. When Karen Weigt asked me to review Mark Warda’s Political Campaign Stamps, recently issue by Krause Publications, I was confident I knew exactly what to expect - a catalog listing cinderella stamps from the various United States presidential and political campaigns. The moment I opened the large format, 223-page book, I realized how much larger the subject was and what a wide range of material tell within the designation "political campaign" stamps. The first two chapters of Political Campaign Stamps contain just what you might expect: listings of presidential campaign stamps and presidential stamp sets along with political party stamps, state and local candidate stamps, and even fantasy candidates. In this last category, Alfred E. Newman, of Mad Magazine's "What me worry?" fame, has a priced listing of 38 varieties. Each candidate or category is assigned a separate combination of letters and numbers - generally the candidate’s initials - to make identification of the stamps easier. In his introduction, Warda warns readers that the price ranges quoted for material in his book should be viewed as a guide since prices are "elastic." Philatelists, apparently, do not value these cinderella stamps and labels as highly as do political specialists. If the pricing is inexact, the book, he contends, still should help people develop a sense of the general scarcity or commonness of the political stamps he catalogs. Five rich chapters list material beyond the stamps simply created for political candidates. A chapter on civil rights contains stamps on women's rights (both for and against suffrage), blacks (NAACP stamps), and even Klu Klux Klan stamps. Other chapters list stamps that focus on economic causes, representing stamps on everything from National Recovery Administration stamps to stamps promoting or warning against movements from labor unions to communism and socialism. Another chapter focuses on social causes. In these pages, Warda lists stamps that were produced to take a stand on issues as diverse as alcohol, tobacco, drugs, abortion, birth control and social disease, including AIDS. Perhaps one of his most useful sections is on patriotic, war, and peace stamps. This chapter covers cinderella material issued starting with the Civil War and running through World Wars I and II. Most collectors, myself included, have some of these colorful patriotic stamps and labels tucked away in a corner, and the catalog listing of this material finally allows us a way of identifying our holdings. A final chapter lists a hodgepodge of issues ranging from busing to pollution. 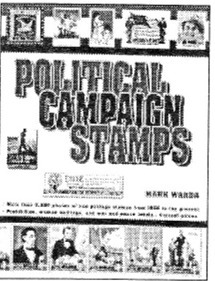 Political Campaign Stamps is an informative guide for the general collector and a "must have" for the cinderella philatelist. Sharper illustrations would have made me happier, but I am grateful for the effort that went into this fine guide.